With over 130 stores across Ireland, and a history stretching back 70 years, Dunnes Stores is not only Ireland’s largest retailer, it is also an Irish institution. Dunnes Stores offers a mix of contemporary fashion, stylish homewares and quality-assured food - all in one location. Their collections include collaborations with leading Irish designers and their own in-house labels. Dunnes’ long-established Better Value promise is your guarantee of the very best prices across all product ranges. How it Works: Use this gift voucher on AllGifts.ie to order gift cards for use in any Dunnes Stores in the Republic of Ireland. Or you can swap this voucher for any other gift or voucher listed on AllGifts.ie. 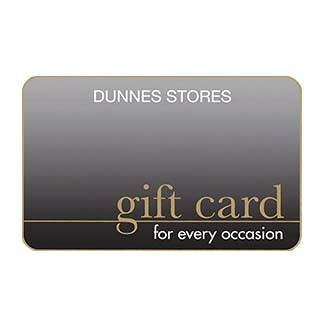 Dunnes Stores gift cards are posted out free of charge once ordered. 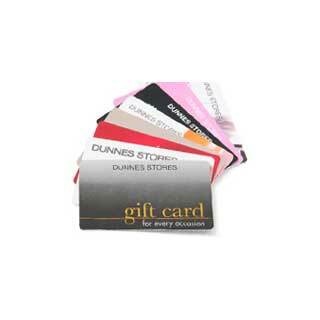 Dunnes Stores gift cards are available in denominations of €20s and €50s (e.g. €20, €40, €50, €60, €100, €150 etc). Minimum gift card value is €20. Dunnes Stores offers a mix of contemporary fashion, stylish homewares and quality-assured food - all in one location. Their collections include collaborations with leading Irish designers and their own in-house labels. In groceries, Dunnes provides an unrivalled selection of fresh quality food from the best local suppliers. Dunnes’ long-established Better Value promise is your guarantee of the very best prices across all product ranges. Dunnes Stores Gift Cards are posted out free of charge, normally within 5 working days.